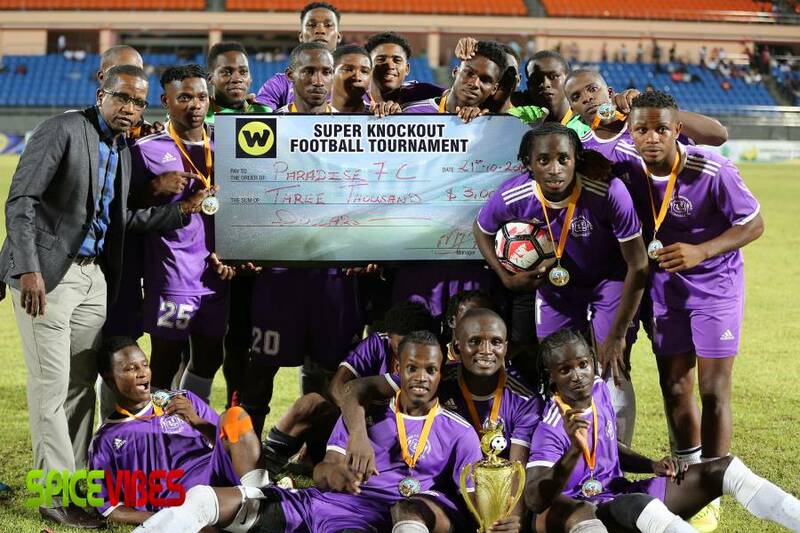 Paradise FC beat Canaries 2-0 in the regional showdown that highlighted the opening of the 9th edition of the Waggy T Super Knockout Football Tournament last week Saturday, 21 October at the Kirani James Athletic Stadium in St George’s. The 4-time champions produced a brilliant display to outplay the St Lucia Super League Champions, Canaries. Hundreds of fans who turned out despite the inclement weather were treated to a high level of football as the teams orchestrated several exciting build-ups. Skipper Jake Renee was bang on target from just outside the 18-yard box, firing a firm right-footer into the bottom right-hand corner, to give the St Andrew’s outfit the lead in the 5th minute. Dareen Modoo made it 2-0 in the 15th minute after being nicely set-up by Shawn Richards from another of the intriguing moves by Paradise FC. They led 2-0 at the interval, and there was plenty of excitement in the second half as the teams pressed for the upper hand. Paradise FC fought diligently to extend their lead to seal the issue, while Canaries dug deep, using all of their resources to bounce back, resulting in a truly gripping contest. In the end, Paradise picked up the bounty of $3,000 and gold medals for the winning team, much to the delight of their fans who made the journey down over the hills from the big parish. Former Champions Eagles Super Strikers out of St Patrick, meanwhile have made an encouraging start in the 2017 tournament. They beat Police 2-1 in the opening game on Saturday. The St Patrick’s outfit had to come from behind, after Samuah Mark put the lawmen ahead in the 15th minute. But the former champions drew level in the 37th minute through Jose Mc Donald and went ahead in the 67th minute by way of an own goal by the Police goal-keeper Wayne Benjamin, who inadvertently punched the ball into his goal. Matches scheduled for Sunday did not play because of the inclement weather over the last week, which has forced a revision of the fixtures. Four matches were played Thursday and Friday, and another 4 are scheduled for this weekend, all at the Kirani James Stadium. Gabriel Five Stars face Combine Northerners in the opening game Saturday from 7 o’clock in the evening, with game two at 9 o’clock between GTC Radio and St David’s FC. On Sunday, Glovers Spice Boys take on Shamrock FC in the opening game from 6 o’clock, while the other from 9, matches Happy Hill FC and Sun Jets United. Over EC$135,000 are up for grabs in the competition with an attractive EC$80,000 set aside for the champions. They will win EC$40,000 for winning the competition, plus an all-expense paid trip of another EC$40,000 to St Lucia to play the champion team at the opening of the St Lucia Super League.